Every time I drive past a Garage Sale, I look for a wing back chair. Ever since I read this tutorial I can't get this out of my mind. I previously posted this chair from Target. And I love it, except that it is $300 bucks... That I don't love. So when I read the tutorial above, I started getting excited! I could paint a chair for WAY less than $300! All I need is a chair, wing back is currently striking my fancy, and I can get those on the cheap from a garage sale or craigslist... So I am keeping my eyes pealed. In the mean time, Andy and I have been thinking a lot about a white couch. Would we love the crispness of it, Yes. But would we freak out anytime anyone sat on it... Yes. So we have started looking for colors to dye it. 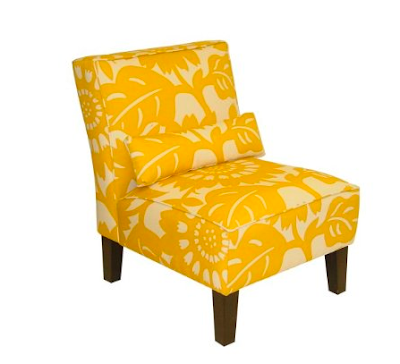 First we thought yellow, but I really think a yellow couch would be too much (hence the yellow accent chair). And I knew blue would be too much. So now we are thinking a blueish gray color, that is dark enough to hide dirt, but not so dark that it would show Max's hair. That upholstery painting tutorial is so cool! I had no idea something like that was even possible!